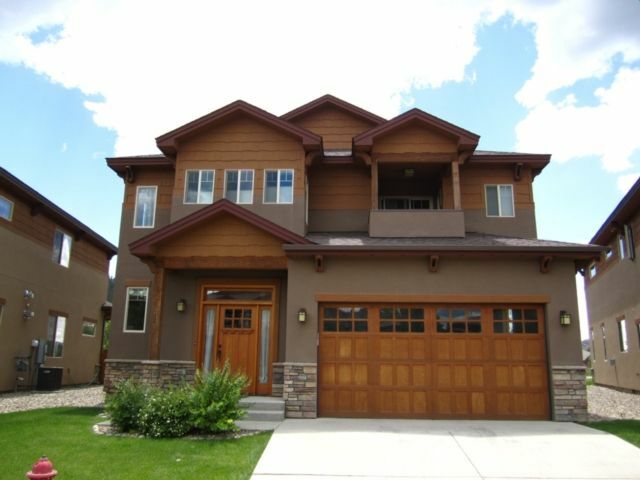 Tierra Verde - Beautiful home in upscale area just minutes from Downtown Durango and across from Hillcrest Golf Course. 3 bedrooms & 2 1/2 baths, sleeps 8 people. Great mountain & golf course views! 3 bedrooms & 2 1/2 baths. Master features a king size bed and 2 guest rooms each feature a queen bed. Sleeper sofa in the den off living room. Sleeps 8 people. CITY PERMIT #2014-02191 This beautiful home offers everything. With a great in-town location, mountain & golf-course views a great floor plan and lots of custom features. The home is also Air Conditioned for your summer comfort and has high-speed inter-net. The main level features a spacious entryway, kitchen with stainless steel appliances, granite countertops, breakfast bar with 4 stools and an open floor plan. Adjoining the kitchen is a living room area with leather sectional, oversized chair and gas fireplace, and flat screen television. There is also a second living area right off the kitchen that has two chairs and a sleeper sofa, perfect for relaxing with a good book. Just outside is a great deck area with views, patio furniture and a gas grill. A formal dining room is also located nearby with a wet bar and wine chiller and seating for 6. A 1/2 bath is located in the entryway as well as access to the two car garage. The upstairs level has 3 bedrooms and a loft area with foosball table. The master bedroom is really nice and roomy, it has another gas fireplace, private deck, a king size bed & a flat screen TV. The master bath is breathtaking with a Jacuzzi bathtub, separate glass shower, walk-in closet, double vanity and awesome views. The two guest bedrooms each have a queen size bed and shared bathroom. There is also another deck located off the loft area which is very private and has great mountain views. A laundry room is conveniently located on the upper level. All three bedrooms also have a ceiling fan. Beautiful place, very clean, and great location!!! In town to visit my parents, the Tierra Verde house provided the perfect accommodation to be close to family while giving everyone a comfortable stay. The quality of all amenities is in the top 1% of all VRBOs I've stayed at. Beds are amazingly comfortable, rooms are generous in size, and the downstairs has plenty of for relaxing, sharing a family meal, or enjoying a night of board games. Kitchen is well equipped with everything you cold need. There are games, books, puzzles, foosball. Location is 5 - 6 minutes away from downtown Durango, yet in a quiet neighborhood. More beautiful than you can imagine! The owners have impeccable taste. The home is more lovely than pictured! Fantastic location! Very nice house. Well appointed. Just had the bad luck of being there when the AC and Internet broke. Quiet neighborhood, short distance from down town, space for everyone to relax, furnishings comfy and inviting. Did not want to leave. Loved our stay at Tierra Verde! We thoroughly enjoyed our stay at Tierra Verde! The home was beautifully appointed with everything we needed for a comfortable stay. The property management team was also very accommodating and timely in responses. No hassles or issues with getting access to the home the day we arrived. We were especially amused by the lynx (taxidermy) who greeted us upon our arrival. (We're from Minnesota, and the Lynx had just won the WNBA championship the day before.) ;) The house was clean, and well cared for, and located in a peaceful neighborhood. Although we didn't do a lot of cooking, it wasn't because we didn't have what we needed. The kitchen was well-stocked with all the dishes/pots/pans/utensils we would have needed. The furnishings were all very comfortable and inviting. We enjoyed the patio area and all the beautiful fall color that surrounded us! No issues at all with the internet and being able to work remotely. It was a bonus to be able to park a car in the garage. We appreciated the added security as one of our vehicles was heavily packed. The location was great. It was a short drive to visit any of the downtown Durango attractions. We found the "check out" requirements reasonable and had no issue complying with the requests. Would definitely stay here again! Thank you for sharing this lovely home with us! Located near Fort Lewis College and just 5 minutes from Downtown Durango. Directly across from Hillcrest Golf Course. Cleaning fee is an additional $200.00 Prices do not include 9.9% tax. $250.00 Damage deposit required if paying by check. Weekly rates based on 7 nights. 50% of Lodging due at reservation, balance due 30 days prior to arrival. Visa, MC or Discover accepted. 4 nights minimum. Weekly Rates include cleaning fee. Nightly rates add on $200.00 for cleaning fee. Weekly rates are for 7 nights.